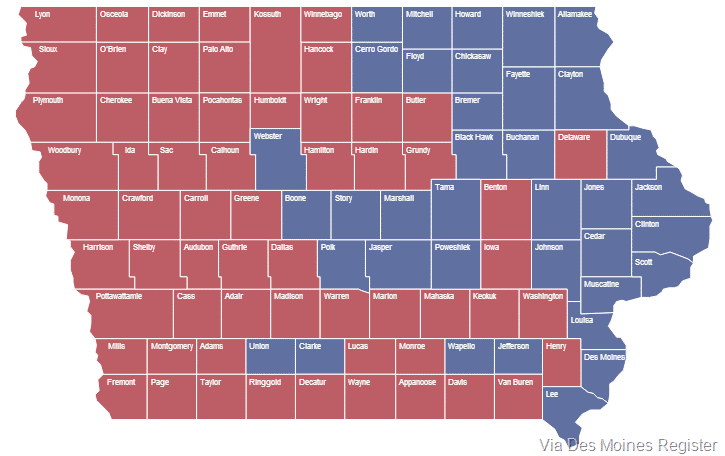 Looking at the 2012 election results in Iowa it is evident that Iowa is very much a divided state – geographically and ideologically. 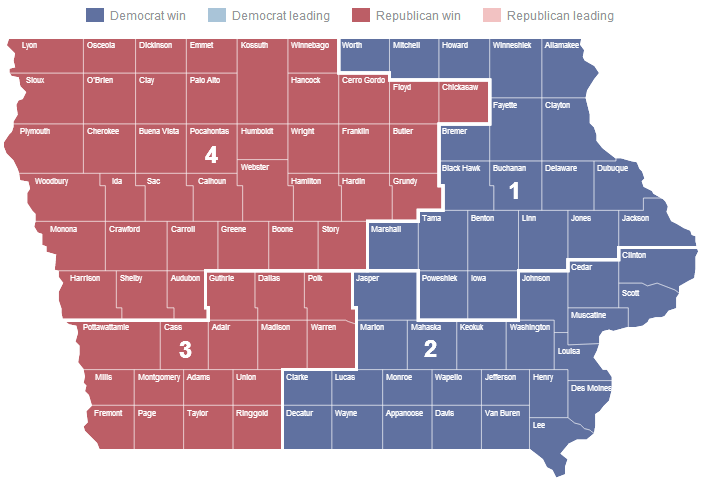 Looking at the 2012 election results in Iowa it is evident that we are very much a divided state – geographically and ideologically. The map of the Presidential election outcome shows a clear picture that we have two different Iowas – East and West (red for Romney, Blue for Obama). Women carried President Obama in Iowa (as well as nationally) as we seen from some exit polling via CNN the percentages in parentheses is percentage of those polled who made up that group. Women outnumber men 54% to 46% who voted 59% to 40% over Mitt Romney. Romney won among men 53% to 40%. Barack Obama won among 18-29 year-olds (15%) by 16 points. He also won among 30-39 year-olds (14%) by 10 points. Mitt Romney won among 40-49-year-olds (17%) by 6 points. Obama won 50-64-year-olds (28% of the electorate) by 12 points, and they tied among 65 and older (26%). Both parties went overwhelmingly for their candidates. 95% of Democrats voted for Obama, 93% of Republicans voted for Romney. President Obama won among the independents who represented 34% of the electorate by 14 points. It was mainly the independents who also voted 3rd party, but not enough to make a difference. Those who made less than $50K (43% of electorate) chose Obama 59% to 38% (37% of electorate), those who made between $50-100K went slightly for President Obama 50% to 49%. Romney won those who made $100K or more (19% of the electorate) 54% to 45%. Mitt Romney won among those who attended religious services more than weekly or more (42% of those polled) 63% to 37%. Those who attend occasionally (40%) President Obama won 55% to 43%. Among those who never attend (16%) he overwhelmingly beat Romney 76% to 21%. 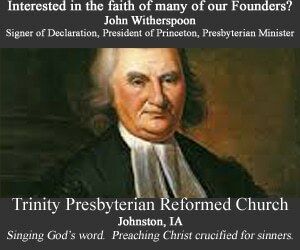 Mitt Romney won among Protestants (62%) 53% to 46% and Catholics (26%) 52% to 47%. Among those who consider themselves “Born again Christians” (38%) Romney won 64% to 35%. Among those who don’t (62%) Obama won 60% to 38%. 55% of those polled said abortion should be legal. They went for Obama 75% to 22%. 39% say abortion should be illegal, and they voted for Romney 77% to 22%. 53% of those polled say Obamacare should be repealed and they voted for Romney 74% to 24%. 38% said it shouldn’t be repealed and they voted overwhelmingly for Obama 91% to 9%. 50% of those polled said taxes should be increased for those making $250K or more. They went for Obama 72% to 27%. Those who say taxes shouldn’t be increased (32%) went for Romney 76% to 24%. 13% said taxes should be increased for everybody and strangely they favored Romney 56% to 42% – obviously had other issues driving their vote. 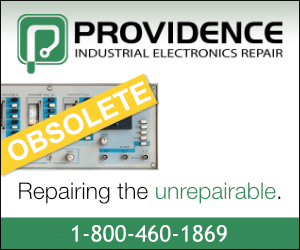 You can catch the rest of the exit poll here. The Washington Post compared 2012 exit polling with 2008 exit polling which is also pretty interesting. We voted for status quo in the state legislature see map below – first the Iowa House. I won’t write more about that since that was my topic last night. While Iowa Supreme Court Justice David Wiggins survived his retention vote 54.5% to 45.5%. 564,821 voted no… not as high as 2010, but not an insignificant number. This year was a presidential election with a higher voter turnout, and a “vote yes” group that was better mobilized than last time. Also as time wanes people are not as passionate. 676,622 people voted in favor of judicial activism and tyranny. As with most people who vote yes on retention it was more of a rubber stamp and less a vote of conviction – like most retention votes go. That isn’t to say everybody who voted yes voted that way, but that is how it usually goes with back of the ballot initiatives. Also as the state went with President Obama you can see a correlation of how they voted on Wiggins – not exactly, but pretty close. In Iowa’s First Congressional District Race Congressman Bruce Braley (D-IA) drubbed his Republican challenger, Ben Lange 57.7% to 42.3% with almost 59,000 votes separating them. Lange was only able to win three of 20 counties: Delware, Iowa and Mitchell. Braley’s biggest advantage came in the population centers winning by large margins in Black Hawk, Dubuque and Linn Counties. In Iowa’s 2nd Congressional Race Congressman Dave Loebsack (D-IA) defeated Republican challenger John Archer 55.4% to 42.5% with 48,834 votes separating them. Archer picked up only 9 counties of 24 in the district: Henry, Keokuk, Louisa, Lucas, Mahaska, Marion, Monroe, Van Buren, and Wayne Counties. Marion and Mahaska Counties in particular are not surprising as they are more “churched” than some of the others. 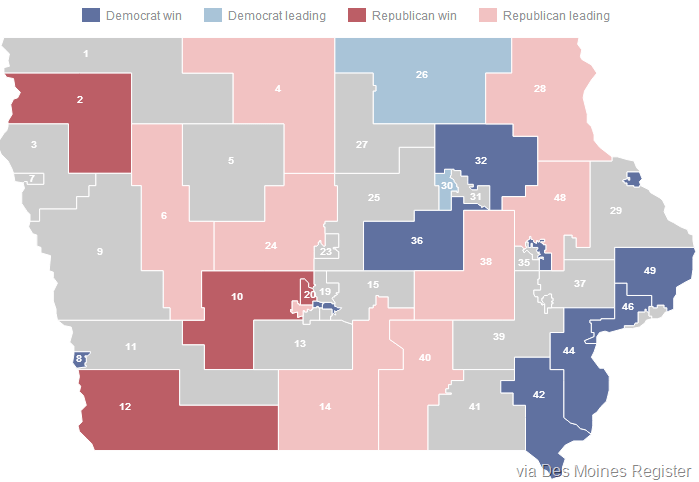 Republicans did well in the State House and State Senate races in those counties as well. It when you get to the eastern half of the district where Loebsack picked up the more populous areas in Clinton, Johnson and Scott Counties. In Iowa’s 3rd Congressional District incumbent Congressman Tom Latham (R-IA) and incumbent Congressman Leonard Boswell (D-IA) faced each other due to redistricting. Latham beat Boswell 52.3% to 43.6% to put this district back into the Republican column after it had been held by Boswell since 1997. They were separated by 33,492 votes, but what is most telling to me is that Boswell only won one county – the most populous in the district – Polk County, but out of 223,377 votes cast he only beat Latham by 4200 votes. I had the opportunity to be at Latham’s victory party where I live blogged election night. I was able to video his victory speech with an introduction from Iowa Governor Terry Branstad. In Iowa’s 4th Congressional District Congressman Steve King (R-IA) defeated Democrat challenger and former First Lady of Iowa Christie Vilsack 54.4% to 45.6% with just over 31,000 more votes. This is the largest geographical districts in the area. 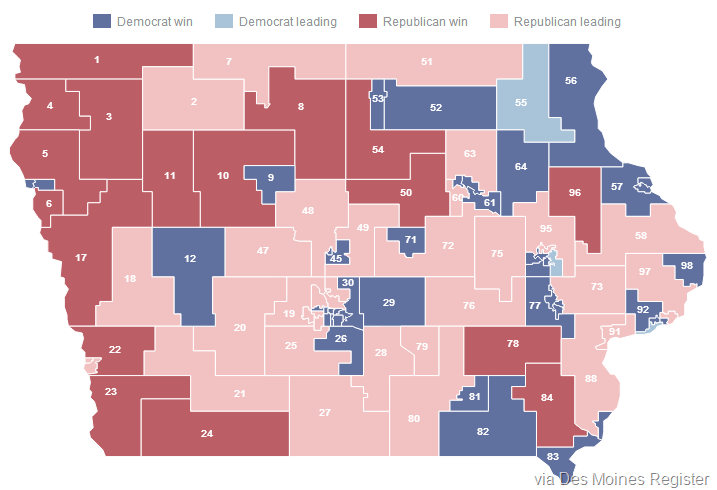 Vilsack only won 6 of the 39 counties: Boone, Cerro Gordo, Chickasaw, Floyd, Story and Webster. Her largest advantages came in Ames (Story County) and Mason City (Cerro Gordo County). Congressman King edged Vilsack out in Woodbury County (Sioux City) by 2200 votes. This largest margin of victory was in Sioux County where he won by 11,302 votes. This was Congressman King’s toughest challenge especially after redistricting with new counties, but it shows that is is still safe Republican territory. I’ve told people before that Iowa is politically schizophrenic, but that isn’t entirely true. We have a definite divide in our electorate between East and West and urban and rural, and it would seem men and women. Thanks for providing an overall report on the election in Iowa. Caffeinated Thoughts launched its first online 2014 straw poll for the Iowa U.S. Senate Republican Primary race.